It's that time of year, when a novus Ordo we actually like is issued. Much of the world is already celebrating a secularized version of Christmas. As the lights and trees go up, it is a good time to emphasize some key dates concerning the new liturgical season. Advent begins on Sunday, 3 December, this year (technically beginning with first vespers on 2 December). The feast of the Immaculate Conception of the Blessed Virgin Mary, 8 December, falls on a Friday this year, meaning one may eat meat that day following the centuries-old discipline where abstinence is waived on days of precept. The winter ember days are 20 December, 22 December and 23 December. Christmas Eve, 24 December, falls on a Sunday this year instead of the Fourth Sunday of Advent (this differs from the novus ordo), the first time that will happen since Summorum Pontificum. The Vigil of Christmas TLM, celebrated in violet, will be new to a lot of communicants. The traditional discipline of fasting and abstinence on Christmas Eve does not apply this year due to the vigil falling on a Sunday, although many dinner menus will probably still go with the customary seven fishes. 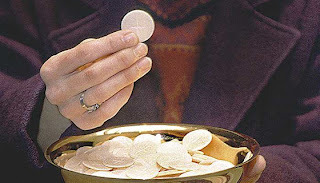 In the older form of the Confiteor, which is prayed three times in the 1962 liturgy, specific saints are invoked: the Blessed Mother, St. Michael the Archangel, St. John the Baptist, St. Peter, St. Paul, and then all the Saints. While the listing of these saints in the Confiteor was not retained in the liturgical changes after the Second Vatican Council, this ancient tradition is vital for the spiritual growth of the members of the Body of Christ, for a number of reasons. Indeed, praying for the intercession of the saints while we are on our journey toward the heavenly patria is essential for our sanctification, for these individuals have come before us and are now worshipping before the heavenly throne of God. The Confiteor is the prayer that asks the Lord to pardon of us of our sins. We admit that we have sinned against our Lord, and we recognize that we are in need of His mercy, of which we are certainly not deserving. How fitting, then, for us to pray to the saints when asking for the Lord’s mercy. Indeed, the Psalms of David reveal a saint who prayed to the Lord for mercy, because he was aware of his deep and profound sinfulness: “Have mercy on me, O God, according to your merciful love; according to your abundant mercy blot out my transgressions” (Psalm 51:1). As we did last year when he was setting up his new hermitage, we once again ask our readers to help a priest formerly of the Franciscan Friars of the Immaculate (FFI), who is now living as a hermit in the Diocese of Harrisburg. We here at Rorate chronicled the brutal treatment of these priests -- and the utter destruction of their order -- under the current pontificate for the last few years. So those of you who have read this blog for a while know what they've gone through. This good priest's request is a win-win for him, his new mission and you. By helping him you are helping sanctify your family and/or other families you enroll. What a great Christmas present this would make for your family or a family you care about! Deadline to enroll is December 17. Bishop Ronald Gainer, Fr. 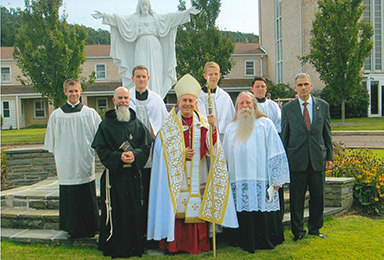 Maximilian Mary (black habit), witnesses and servers after Father’s 1st profession as a hermit in the Diocese of Harrisburg on Sept. 12th, 2017. 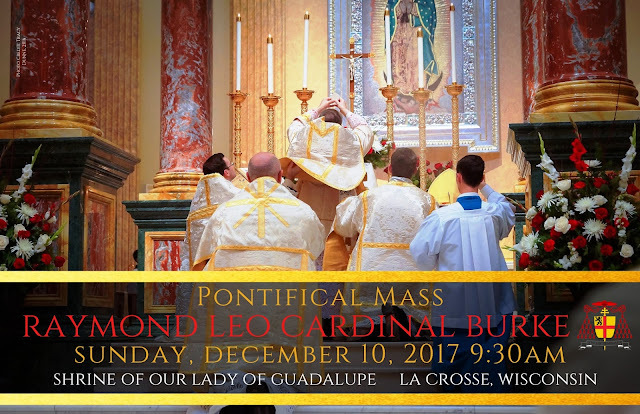 * Cardinal Burke will be celebrating his second Pontifical High Mass at the Shrine of Our Lady of Guadalupe on December 10. See the image below for more information. * The city of La Crosse is gaining a weekly Sunday Latin Mass. It will be at 11:00 AM at St. James the Less Catholic Church. The first Mass will be on December 3, the First Sunday of Advent. Masses will be Missae Cantatae. There is a great deal of good Catholic audio to be found on the internet nowadays. We want to alert our readers to things in particular. First, our friends at the Roman Forum have put a large number of lectures on Church History by John Rao up on Soundcloud. Included are the completed lectures of the current year (2016-2017), which is about the years 1794-1846, and all the lectures of last year (2015-2016), which was about the years 1748-1794. We encourage our readers to take a break from current events, and recall the Church’s struggles in previous centuries. The eighteenth and nineteenth centuries were periods in the Church’s life with many parallels to our own. The temptation to water down the faith, and try to make it palatable to modernity can be found then as now. And Rao masterfully shows how all attempts do so were counter-productive and disastrous, whereas attempts to recover the fullness of the Church's Tradition bore great fruit. Venice 31 October 2017: What goes around comes around! Note: We missed this one on the official day -- but better late than never. What goes around comes around! Last October 31st on the five hundredth anniversary of the Protestant Revolt, some unidentified person/people stuck a copy of Pope Leo X’s Bull Decet Romanum Ponteficem, excommunicating Martin Luther, on the main door of the Chiesa Evangelica Alemanna in Venice. 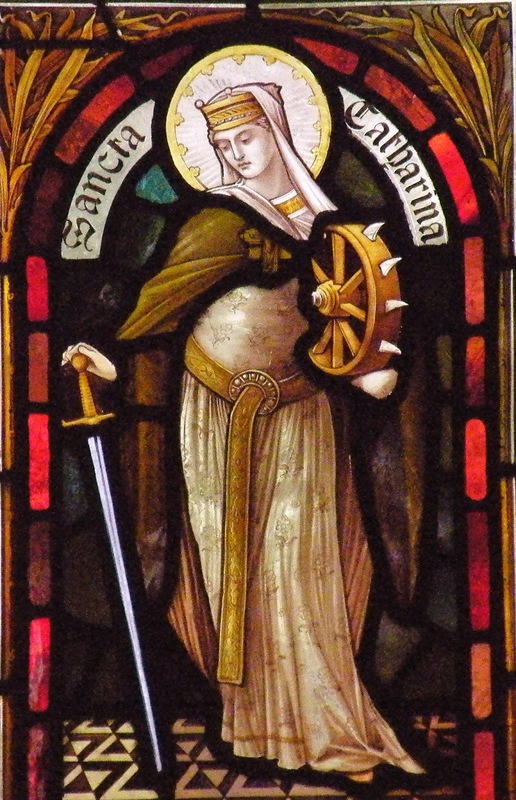 As one who has spent many years of my life studying and teaching philosophy, I have always felt a special devotion to St. Catherine of Alexandria -- or at least, ever since I first learned of her existence and patronage. A friendly and tasty annual reminder that there is a strong argument to be made that there is no required abstinence from meat this Friday for our American readers. While always a topic of great discussion, it is widely known by those alive in the 1950s, that Venerable Pope Pius XII granted Americans a dispensation from their Friday abstinence, so that they could enjoy turkey the Friday after Thanksgiving. I am writing this as a personal letter to the readers of Rorate Caeli for a special reason, which I will address in the third paragraph below. Today we celebrate the feast of Saint Cecilia, Virgin and Martyr. We know little about her life and even her martyrdom in the third century from contemporary sources. 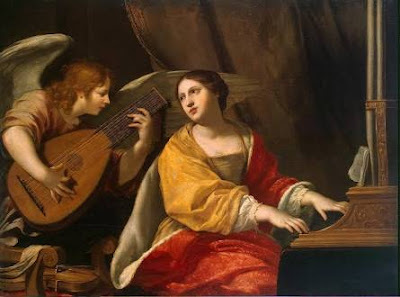 But we know the strong and early devotion of Christians to this young woman, and the basilica raised in honor of Saint Cecilia by Pope Urban I in the third century in Rome. Many of the popular stories about her come from the Acta of her life written much later, probably in the sixth century. Scholars seem to say that the details of her life and martyrdom as depicted in this work may have little real historical detail. We’ll leave that for the experts in hagiography to work out. 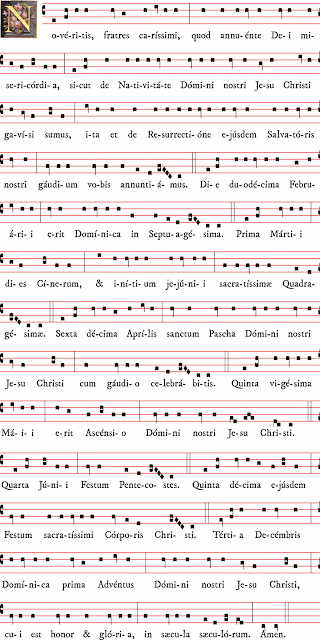 No experts are needed to tell us that the antiphons at Lauds and Vespers come from the Acta, and they are beautiful indeed. For the record: Fr. 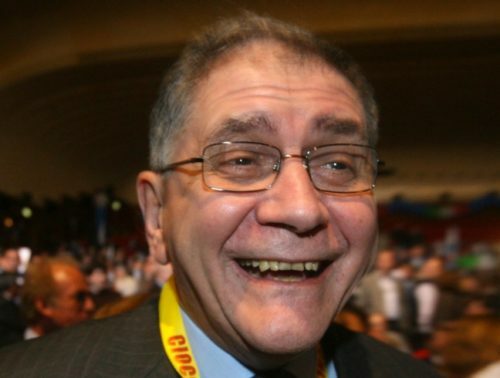 Minutella threatened with "double excommunication"
Today I am publishing, after a bit of a break, another in the series of Position Papers which have been produced by the FIUV (Una Voce International). This one addresses the challenge to the Church of the New Age movement, and the role the Traditional Mass could have in meeting that challenge. 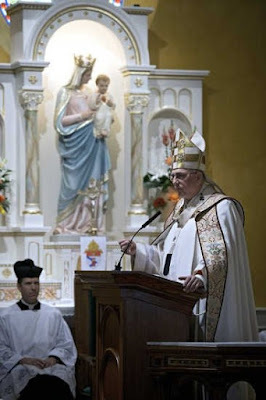 Relevant to this is the review I wrote on this blog of Roger Buck Cor Iesu Sacratissimum, on his journey from the New Age to Catholic Tradition, here. I have written some further reflections on the paper on my own blog here. See all the papers in the series here. 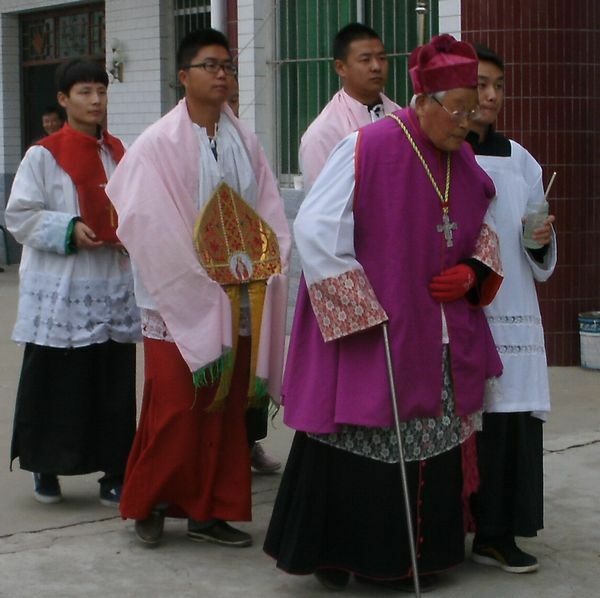 Bishop Luke Li Jingfeng of Fenghsiang, an 'underground' bishop consectrated secretly, died this morning (11:20pm GMT) at 97. Please pray for him. Bp. Li was a pillar of traditionalism, as well as of true fidelity to the See, in the Chinese speaking Church. In his nineties he translated the 1962 missal into Chinese, to aid Chinese speaking clergy in the understanding of the prayers. This massive project will continue to be of great significance for Chinese Catholics far into the future. On a more personal level, he and some of the priests in his diocese gave the old Mass movement much support. The Novus Ordo Missae was not introduced into China until the 1980s, so there remains a generation of priests who were taught the the ancient Mass in seminary. See the FIUV Position Paper on the Extraordinary Form and China. I have known Rocco Buttiglione for more than forty years. Both of us were assistants to Professor Augusto Del Noce (1910-1989) at the Faculty of Political Science at La Sapienza University in Rome, but since then our positions have diverged, mainly regarding our judgment on modernity. Buttiglione believed that the historical process inaugurated by the French Revolution was compatible with Christianity, but I believed it incompatible. Despite these differences, I appreciated Buttiglione’s work as Minster of National Cultural Heritage in Berlusconi’s government (2005-2006) and expressed my solidarity with him in 2004 when he didn’t attain the nomination as European Commissioner as a result of having called homosexuality “a sin”. 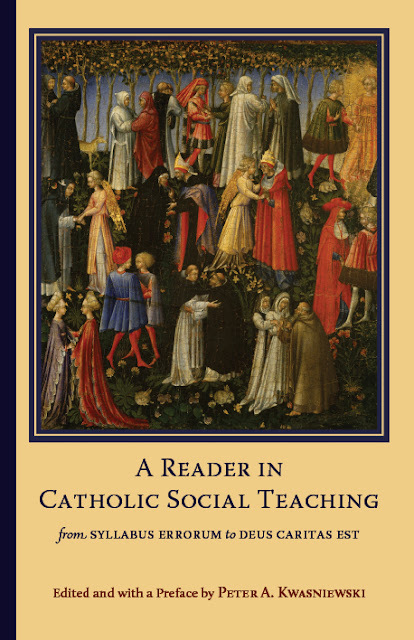 I refer to all this in order to show my sincerity in my “friendly criticism” of his theses, just as Buttiglione is truly sincere when he argues with Professor Seifert, his “life-long friend” in his most recent book (Friendly Responses to the Critics of Amoris Laetitia, which included an essay introduction by Cardinal Gerard Ludwig Müller, Ares, Milan 2017, p. 41). Once again we hear from the highest circles of power in the Church of the possibility of ordaining married men to the priesthood. But this time, what is being talked about is not men in “special circumstances” but in general. I was able and gratuitously blessed to be ordained a Catholic priest while married because of a special Pastoral Provision instituted by Saint John Paul II in 1982 that gave permission for married Episcopal priests who had left the Episcopal Church because of reasons of conscience to be considered for the Catholic priesthood. 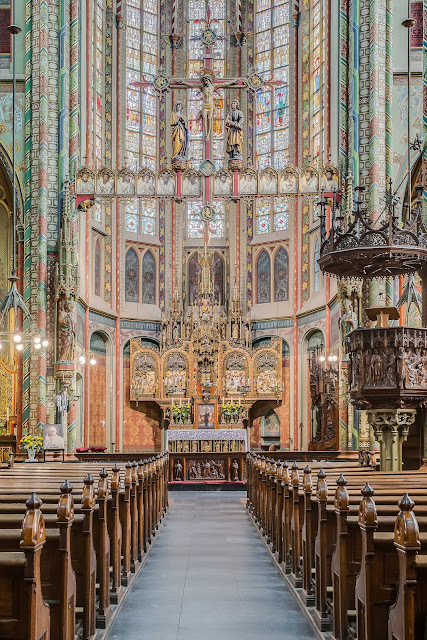 For me these reasons for leaving Anglicanism included the ordination of women priests and women bishops and the rapidly accelerating cutting of ties to Christian orthodoxy. 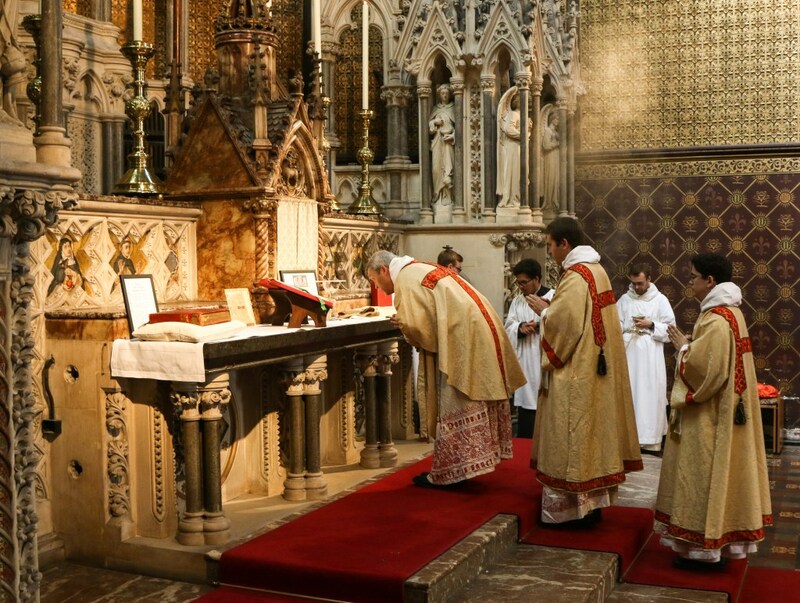 The recent formation of the Anglican Ordinariate is the result of a similar situation where Anglican priests who want to be in full Communion with the Catholic Church are given this special privilege and grace. Surprising liberals and the social justice wing of the American Church at today's U.S. Conference of Catholic Bishops general assembly, Archbishop Joseph Naumann beat Cardinal Blase Cupich in an election for the chairmanship of the committee on pro-life activities. Mission Tradition of the Priestly Fraternity of St. Peter (FSSP) is pleased to announce that registrations are now open for two different programs this summer. The Saint Francis Xavier Mission Trip is now in its 6th year. This year there will be trips to Mexico, Peru, and the Dominican Republic. 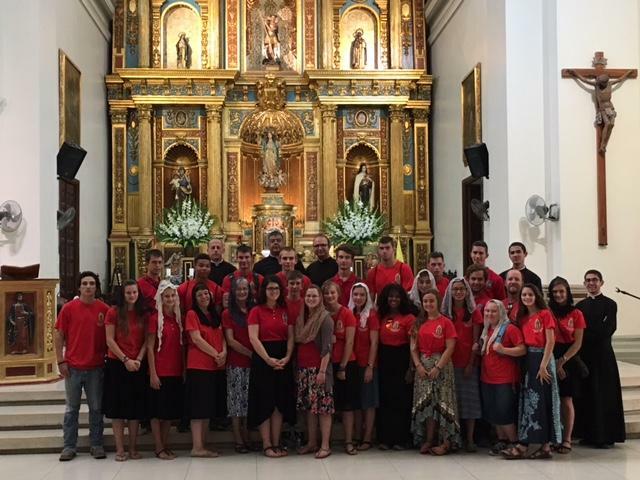 These mission trips give young people and families the chance to practice the corporal and spiritual works of mercy and be enriched by daily Traditional Mass by FSSP chaplains. Please visit our new site website (here) and view the promotional video (here). In the post-Christian West, this is seen over and over again: in the end of the 20th century, and first decades of the new one, the same mistake that paved the way in the mighty Russian Empire in the end of the 19th century, and first decades of the new one: a rejection of good CONSERVATISM, a "slavery to Progressive quirks." Dostoevsky's DEVILS - apparently a provincial nightmare fantasy of the last century - are crawling across the whole world in front of our very eyes, infesting countries where they could not have been dreamed of; and by means of the hijackings, kidnappings, explosions and fires of recent years they are announcing their determination to shake and destroy civilization! And they may well succeed. The young, at an age when they have not yet any experience other than sexual, when they do not yet have years of personal suffering and personal understanding behind them, are jubilantly repeating our depraved Russian blunders of the Nineteenth Century, under the impression that they are discovering something new. They acclaim the latest wretched degradation on the part of the Chinese Red Guards as a joyous example. In shallow lack of understanding of the age-old essence of mankind, in the naive confidence of inexperienced hearts they cry: let us drive away THOSE cruel, greedy oppressors, governments, and the new ones (we! ), having laid aside grenades and rifles, will be just and understanding. 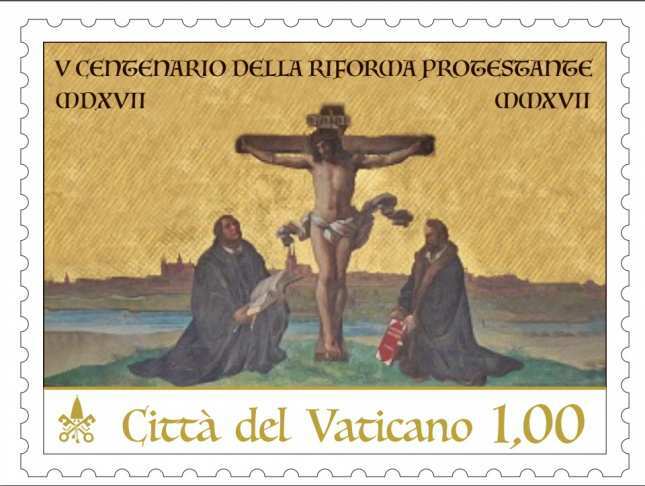 St. Charles Borromeo, flagellator of Protestants, I entreat you on this your feast day, concerning the infatuation many priests have for Martin Luther, witnessed recently in Milanese exhibitions and Vatican stamps. Yet, where priests are surrendering, painters are resisting. 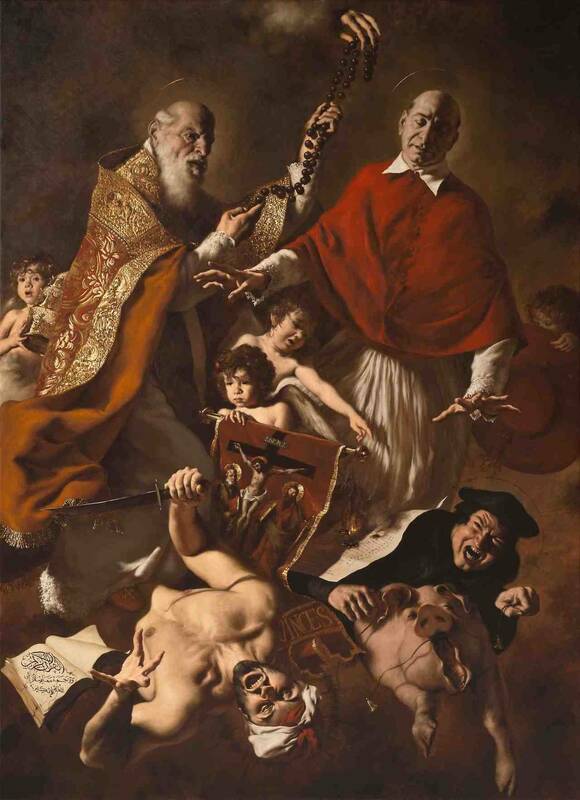 In Imola, Sergio Padovani at present is exhibiting a portrait fittingly entitled "Martin Luther, the Heretic" while in Aldefia Giovanni Gasparro is busy putting the final brushstrokes to his work of the following sensational title: "St Pius V and St. Charles Borromeo defending Catholicism against Islam and the Protestant Heresy." Commissioned, naturally, not by an ecclesiastic, but a member of the laity. He who was called “a blind heresiarch” by St. John Bosco and by St. Peter Canisio “an impious blasphemer” is depicted alongside a pig and with swinish eyes: inclined to evil, to guzzling and nuns, [in fact] his contemporaries used to call him Porcus Saxioniae. The archbishop of San Antonio, Texas -- Gustavo Garcia-Siller -- issued a statement following yesterday's massacre in a Protestant church in Sutherland Springs, Texas, saying: "These Baptist brethren are our family, friends and neighbors who live among us in the archdiocese; just minutes away from our Wilson County parishes of Sacred Heart in Floresville, St. Ann in La Vernia, and St. Mary in Stockdale." 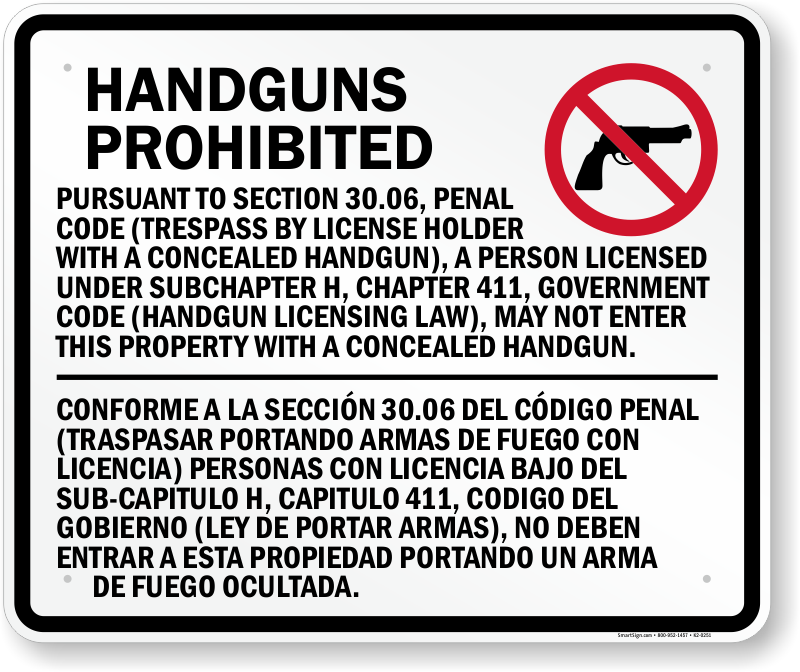 Yet, if the mass shooting had indeed been at a nearby Catholic parish, we are sad to say law-abiding citizens would be forced to merely watch the massacre, despite anyone in the pews having a state-issued license to carry a firearm. 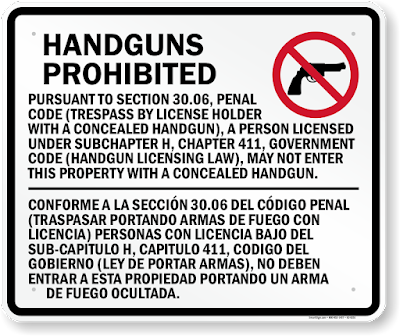 Although firearms can be carried in a church in Texas with a license, the church owner has the right to object. Below is a nice update of the construction progress for the new church for the Benedictines of Mary, Queen of Apostles. These great sisters have a special place in our hearts. St. Joseph is keeping up his end of the deal -- now they need your help as well! Inspired by recent debates on the matter, we repost this 2011 item. Translation problems? 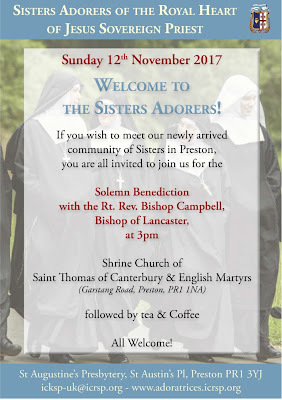 Mass celebrated towards the people? 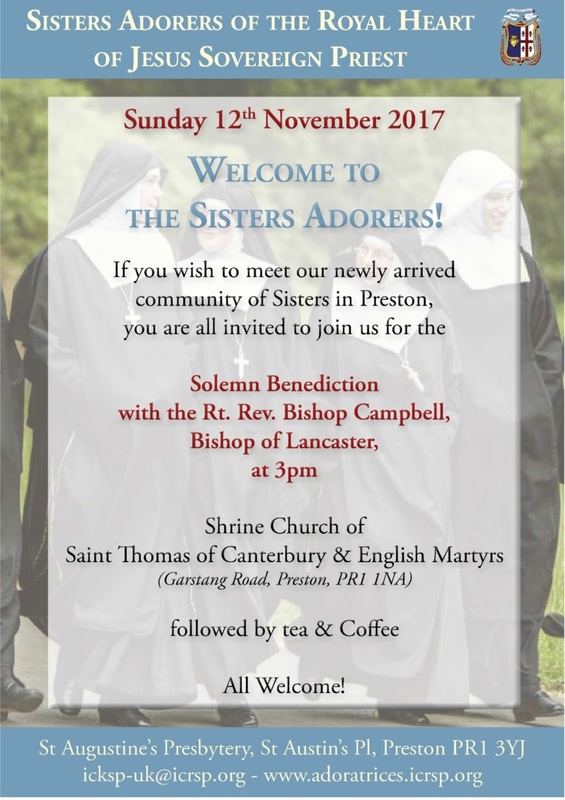 Altar girls? Postures? 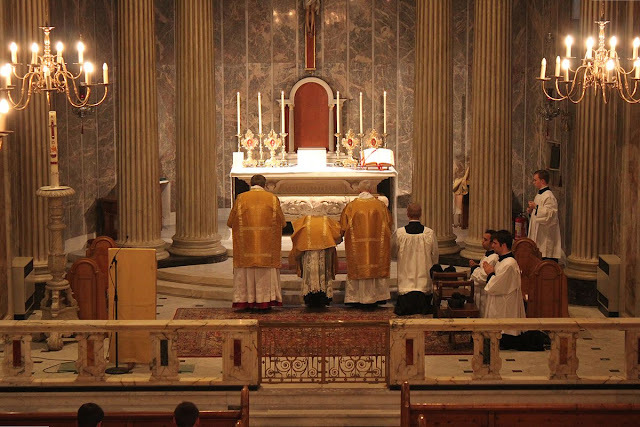 No, the greatest and gravest problem of the liturgy of the Latin Church - that is, of the "Ordinary form", or Mass of Paul VI - is one that transcends all this, even it is related to all of them: it is the way the Body of Christ is treated. 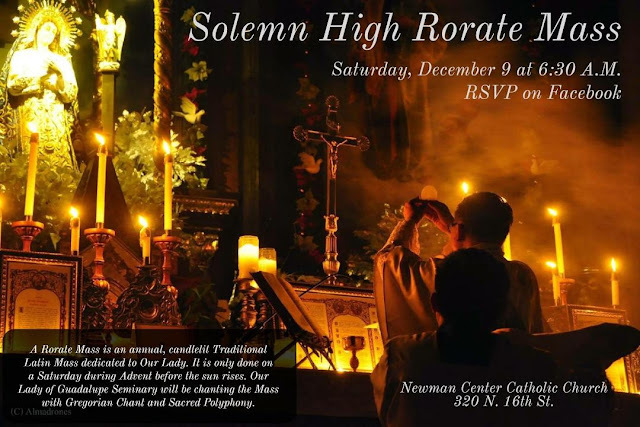 Last month, we added two good priests to the Rorate Caeli Purgatorial Society, and now have 85 saying monthly and weekly traditional Latin Masses for the Souls. 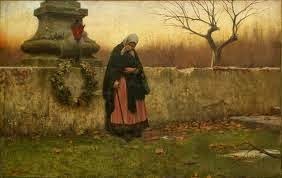 Also, please, we beg you, don't forget the poor Souls on All Souls Day tomorrow (Thursday). Besides getting Masses said for them, as we do here, the best way you can help them tomorrow is this: Plenary Indulgence for each day of the First Full Week in November. 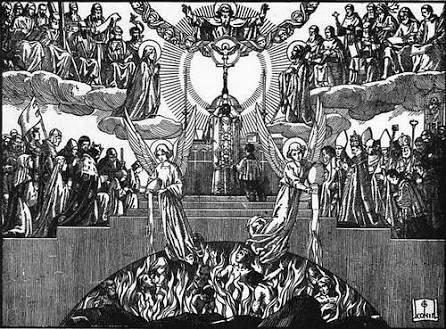 * For a plenary indulgence be free from all attachment to sin, even venial sin (otherwise, the indulgence is partial, not plenary, “full”). The Croatian Catholic page Bitno.net has just published a substantial interview with our fellow contributor Dr. Peter Kwasniewski. The interview was recorded in Norcia (Nursia, Umbria, Italy) this past July, then transcribed and translated into Croatian by the journalist (which explains the conversational tone at times). His story is that of so many of us: how discovering the Traditional Mass changed his life forever, and how it all evolved from there. The English transcript was offered to Rorate Caeli for publication. The photos are as they appear at the Croatian site. Before we get into our questions today, Dr. Kwasniewski, tell our readers about yourself. Where did you study and where do you teach? “Now there stood by the cross of Jesus, his mother, and his mother's sister, Mary of Cleophas, and Mary Magdalen. When Jesus therefore had seen his mother and the disciple standing whom he loved, he saith to his mother: Woman, behold thy son. After that, he saith to the disciple: Behold thy mother. And from that hour, the disciple took her to his own”. (John 19,25-27). This is one of the most fundamental moments in the Life of Jesus, the very apex of His redeeming mission. Mary is there and right next to Her is John. 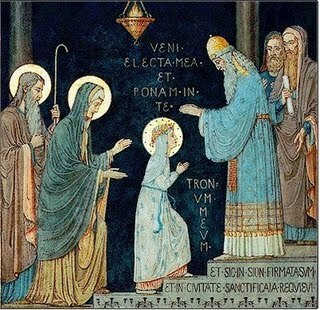 From that moment on Mary is the Mother of all those who are to come into the Church: Mater Ecclesiæ, as Paul VI called Her at the closure of the Second Vatican Council. 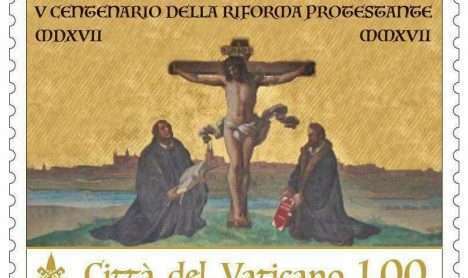 Professor Rocco Buttiglione has been fighting for months against the critics of Amoris Laetitia in an attempt to justify the contents of Pope Francis’ Post-Synod Exhortation. Now he has gathered his articles in a book entitled: Friendly Answers to the Critics of Amoris laetitia, published by Ares, with a preface unexpectedly written by Cardinal Gerhard Ludwig Müller. Andrea Tornielli reports in Vaticaninsider a large extract of this introduction which adds to the present reigning confusion. The former Prefect of the Congregation for the Faith, unlike Prof. Buttiglione, has always manifested a certain sympathy for the four “dubia” cardinals, but retains that to “neutralize” Amoris laetitia it would be better to interpret it in continuity with the teaching of the Church, rather than criticize it openly. To explain the apparent contradiction between Amoris laetitia and the definite dogma of the Church on the Sacraments of Matrimony, Penance and the Eucharist, the Cardinal makes Rocco Buttiglione’s thesis the basis of his own, which is summed up in these two lines: “That which is in question is an objective situation of sin, which, because of attenuating circumstances, is not imputed subjectively”. The United States Conference of Catholic Bishops (USCCB) is a house more divided than one could possibly imagine. The pro-life office on the second floor may as well be in the catacombs. Employees from throughout the USCCB proudly display their Obama for President and other pro-abortion politician bumper stickers in the parking lot. The international justice and peace branch sets the tone for the building, aligned with the far-left wing of the Church. This month's big issue is the annual collection for the Campaign for Human Development. Although some offices within the USCCB have miraculously been staffed in recent years with right-leaning clergy and laymen (the USCCB's government relations director position is currently open to applicants...) leadership will always side with the center-left in the organization. Father Thomas G. Weinandy, O.F.M. 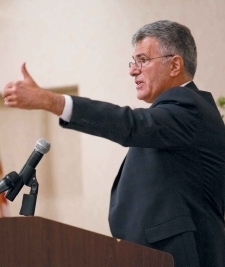 Cap., was the executive director of the USCCB's Committee on Doctrine from 2005 until 2013. Since then, the theologian has been a consultant to that office. 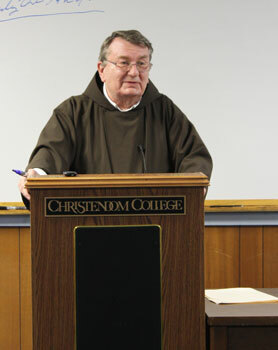 Awarded the Pro Pontifice et Ecclesiae medal by Pope Benedict XVI, and appointed a member of the Vatican's International Theological Commission, Father Weinandy is arguably one of the most respected theologians in the United States. But he dared to challenge Pope Francis, resulting in his forced resignation from the USCCB the same day his concerns were made public. What we come here to do this evening used to be normal, something that many people did, in another time. We come to celebrate the third Mass of All Souls Day in Solemn form, to offer the Holy Sacrifice of the Mass for the faithful departed, for those we have loved and see no more, for those who have died, for those who in our faith and in their faith make sense of what we do here in this church this evening. And yet, and yet, to offer a Requiem Mass, to come together in this church as an annual event that is on the Church calendar and therefore we presume that something happens here and that this is truly an event. But those who come here to this Mass do so as a distinct minority in this present age in the Church and in the world. For those who come here take death seriously, take Kafka’s words: “he died like a dog” seriously as a real alternative to what we believe as Catholics. NOTE: Dear Readers, in all my years of translating religious documents for Rorate Caeli, I have never translated one so devoid of any real content, so forgive me if it’s not a “good” read -- superficiality is not easy to translate. F.R. “Rather than past conflicts, the divine gift of unity among us will guide collaboration and deepen our solidarity. Closely united in our faith in Christ, praying together, listening to one another, experiencing the love of Christ in our relationships, we, Catholics and Lutherans, are open to the power of the One Triune God. Rooted in Christ and rendering witness to Him, we renew our determination to be faithful heralds of the infinite love of God for all of mankind” (Joint Declaration on occasion of the Catholic-Lutheran Commemoration of the Reformation, Lund, October 31, 2016). 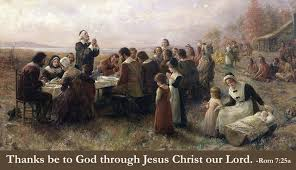 These words have guided the path of reconciliation and sharing which has involved Catholics and Lutherans in many places throughout this year, [so as]to experience a mutual commemoration of the 500th anniversary of the commencement of the Reformation, along the lines indicated in the document: From Conflict to Communion of the Lutheran-Catholic Commission for Unity. 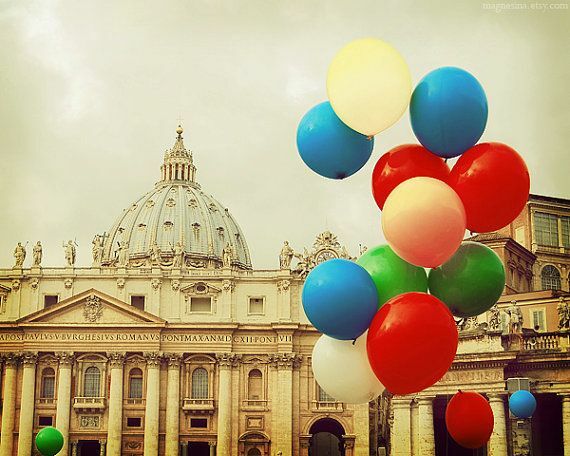 There have been numerous initiatives in Italy, at various levels, in which Christians have taken part in commemorating the Reformation of the XVI century, in a spirit which, even if it cannot be considered a novelty in the light of steps made over the past few decades, it has surely opened up a new season on the path to constructing a visible unity of the Church through which the scandal of divisions can be brought to an end.